STUNNING 3 bed + 2 bath + flex CORNER CONCRETE TH at the VIRTU. 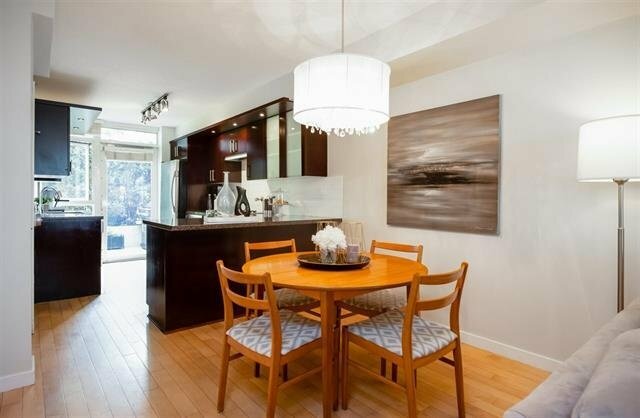 This immaculate home has front & back windows allowing for plenty of natural sunlight. Amazing outdoor living from the 3 separate outdoor areas incl a gated huge patio leading to a private garden oasis. Spacious rooms throughout w/H/W floors in the living areas. Chefs will love the gourmet kitchen w/SS appliances, granite counters & sizable pantry. Upstairs leads you to 2 good sized bdrms & full bath w/soaker tub. The entire top floor is the mstr bdrm w/a spa-like ensuite & private S facing ROOFTOP TERRACE! Amenities include gym, artist studio/library & lounge. Only steps to shops, restaurants, parks, Granville Isl & the seawall. 2 parking & 1 locker included.